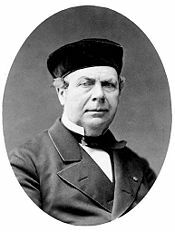 Aristide Cavaillé-Coll (February 4, 1811 – October 13, 1899) was a French organ builder. He is considered by many to be the greatest organ builder of the nineteenth century. His innovations in the art of organ building permeated throughout the profession and influenced the course of organ building through the early twentieth century. The organ reform movement sought to return organ building to a more Baroque style, but in the last few decades of the twentieth century Cavaillé-Coll's designs came back into fashion. After Cavaillé-Coll's death, his son-in-law Charles Mutin maintained the business into the twentieth century. Born in Montpellier, France to Dominique, one in a line of organ builders, he showed early talent in mechanical innovation. He exhibited an outstanding fine art when designing and building his famous instruments. There is a before and an after Cavaillé-Coll. His organs are "symphonic organs," that is, they can reproduce the sounds of other instruments and combine them as well. His largest and greatest organ is in Saint-Sulpice, Paris. Featuring 100 stops and five manuals, this magnificent instrument, which unlike many others remains practically unaltered, is a candidate to become a UNESCO World Heritage Site. Cavaillé-Coll was also well known for his financial problems. The art of his handcrafted instruments, unparalleled at that time, was not enough to ensure the firm's survival. His firm was inherited in 1898, shortly before his death in Paris, by Charles Mutin. He continued in the organ business, but by World War II, the firm had almost disappeared. Cavaillé-Coll is responsible for many innovations that revolutionized the face of organ building, performance, and composition. Instead of the Positif, Cavaillé-Coll placed the Grand Orgue manual as the lowest manual, and included couplers that allowed the entire tonal resources of the organ to be played from the Grand Orgue. He refined the English swell box by devising a spring-loaded (later balanced) pedal with which the organist could operate the swell shutters, thus increasing the organ's potential for expression. He adjusted pipemaking and voicing techniques, thus creating a whole family of stops imitating orchestral instruments such as the bassoon, the oboe, and the english horn. He invented the harmonic flute stop, which, together with the montre, the gambe and the bourdon, formed the fonds (foundations) of the organ. He introduced divided windchests which were controlled by ventils. These allowed the use of higher wind pressures and for each manual's anches (reed stops) to be added or subtracted as a group by means of a pedal. Higher wind pressures allowed the organ to include many more stops of 8' (unison) pitch in every division, so complete fonds as well as reed choruses could be placed in every division, designed to be superimposed on top of one another. Sometimes he placed the treble part of the compass on a higher pressure than the bass, to emphasize melody lines and counteract the natural tendency of small pipes (especially reeds) to be softer. For a mechanical tracker action and its couplers to operate under these higher wind pressures, pneumatic assistance provided by the Barker lever was required, which Cavaillé-Coll included in his larger instruments. This device made it possible to couple all the manuals together and play on the full organ without expending a great deal of effort. He also invented an ingenious pneumatic combination action system for his five-manual organ at Saint-Sulpice. All these innovations allowed a seamless crescendo from pianissimo all the way to fortissimo: something never before possible on the organ. His organ at the Church of St. Clotilde (proclaimed a basilica by Pope Leo XII in 1897) was one of the first to be built with several of these new features. Consequently, it influenced César Franck, who was the titular organist there. The organ works of Franck have inspired generations of organist-composers who came after him. Marcel Dupré stated once that "composing for an orchestra is quite different from composing for an organ...with exception of M. Cavaillé-Coll's symphonic organs: in that case one has to observe an extreme attention when writing for such kind of majestic instruments." Almost a century beforehand, César Franck had ecstatically greeted his discovery of a Cavaillé-Coll instrument with words that summed up everything the builder was trying to do: "Mon nouvel orgue ? C'est un orchestre !" ("My new organ? It's an orchestra!"). This is often attributed to his discovery of the organ of Ste. Clotilde, but there is also a strong possibility that he was talking about the much larger instrument in the Palais du Trocadéro in the Trocadéro area of Paris, which was subsequently removed to a concert hall in Lyon and later destroyed by fire. Cavaillé-Coll, Cécile. Aristide Cavaillé-Coll: Ses Origines, Sa Vie, Ses Oeuvres. Paris: Fischbacher, 1929. Snyder, Kerala J. The organ as a mirror of its time: north European reflections. 1610-2000, Oxford: NY: Oxford University Press, 2002. This page was last modified on 25 April 2013, at 22:41.